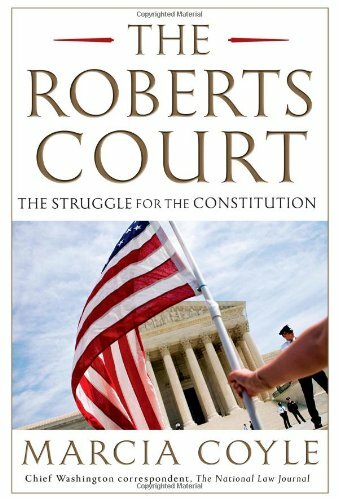 The Roberts Court: The Struggle for the Constitution. By Marcia Coyle. Simon & Schuster 2013. ISBN: 1451627513; 9781451627510. The Roberts Court, seven years old, sits at the center of a constitutional maelstrom. Through four landmark decisions, Marcia Coyle, one of the most prestigious experts on the Supreme Court, reveals the fault lines in the conservative-dominated Court led by Chief Justice John Roberts Jr. Seven minutes after President Obama put his signature to a landmark national health care insurance program, a lawyer in the office of Florida GOP attorney general Bill McCollum hit a computer key, sparking a legal challenge to the new law that would eventually reach the nation’s highest court. Health care is only the most visible and recent front in a battle over the meaning and scope of the U.S. Constitution. The battleground is the United States Supreme Court, and one of the most skilled, insightful, and trenchant of its observers takes us close up to watch it in action. Marcia Coyle’s brilliant inside account of the High Court captures four landmark decisions—concerning health care, money in elections, guns at home, and race in schools. Coyle examines how those cases began—the personalities and conflicts that catapulted them onto the national scene—and how they ultimately exposed the great divides among the justices, such as the originalists versus the pragmatists on guns and the Second Amendment, and corporate speech versus human speech in the controversial Citizens United campaign case. Most dramatically, her analysis shows how dedicated conservative lawyers and groups are strategizing to find cases and crafting them to bring up the judicial road to the Supreme Court with an eye on a receptive conservative majority. The Roberts Court offers a ringside seat at the struggle to lay down the law of the land. Marcia Coyle is the Chief Washington Correspondent for The National Law Journal. A lawyer and journalist, Coyle has covered the Supreme Court for nineteen years. She regularly appears on PBS’s NewsHour. Her work has earned numerous national journalism awards, including the George Polk Award for legal reporting, the Investigative Reporters and Editors Award for outstanding investigative reporting, the Scripps Howard Foundation Award for environmental reporting, and the American Judicature Society’s Toni House Journalism Award.